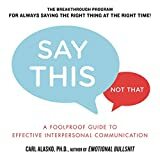 Written by Carl Alasko, Ph.D. The Blame Syndrome (the initial Blame Attack, the Emo­tional Impact and the Reactive Response) damages so many areas of life, and it needs to stop. Because blame can appear as every­thing from an arched eyebrow or a cynical sigh to a shouted accu­sation, identifying blame is not a simple task. And taking steps to eliminate it takes sustained effort. But it's well worth it. The payoff of living Beyond Blame is immediate, tangible and permanent. Time after time when I present the concepts in this book to my patients, I hear, "I grew up with so much blame in my family, if only my parents had been able to..." Or, "My first marriage was nothing but a blame-a-thon. If only we could have..." Or, "If the managers of my company could understand that criticizing and accusing doesn't help, we'd be so much more efficient!" when we try to protect ourselves from being seen as wrong or bad. Here's a step-by-step outline of the interventions necessary for living Beyond Blame. They're arranged in a sequence that won't fit every situation; there's just too much variation within human communications. So be ready to adapt them to your own situation, knowing that every major concept will show up some­where in the process. What do you do when confronted with blame — when someone criticizes, accuses, punishes or humiliates you? How do you take care of yourself? How do you correct a mistake, or get someone to change a behavior? How do you express an emotion, or commu­nicate your own personal needs, without falling into the trap of using blame? FIRST STEP: Use Positive Accountability. Thoughtfully acknowledge an error, your own or another person's, and consider how to repair it, if necessary. Express an emotion, or a need, without using criticism, accusation, punishment or humiliation. SECOND STEP: Maintain a 4:1 ratio of thought to emotion. That's 80 percent thinking to 20 percent feeling. This means that when your sweetheart does something incredibly inconsiderate and you're about to fly into a rage, don't make a move, don't do anything. Stop... and think about the most effective way to respond. You cannot allow powerful emotions to overwhelm your clear thinking. The Question of Intention: "What do I want to accomplish right now, in this moment, with this interaction?" Take a few seconds to think about what you really need, what's in your best long-term interests. Clearly, it's to not humili­ate the other person, or try to get even. Having a clear intention will help you not be overwhelmed by negative emotions. Everyone is always doing as well as they can within their personal limitations, their personal history, what they know and don't know, and what they're feeling in that moment. If they could make a healthier decision, they would. This includes YOU. The Law of Lessons Learned states: Every mistake contains a lesson. Make a note of the lesson, pro­cess the accompanying emotion, and move on with your life. This law teaches us the necessity of extracting the lesson from the mistake or experience, writing it down to refer to in the future, then moving on. Taking the lesson to be learned and dis­carding the incident's details helps to stop brooding over what you could have/should have done. Most important: it eliminates guilt, the incessant self-criticism for a past mistake. This five-step sequence provides a nautical chart to guide you through the jagged rocks that can sink relationships. Using these ethical, psychological, spiritual and practical structures, you have all you need to live completely Beyond Blame. ©2011 by Carl Alasko. All Rights Reserved. a member of Penguin Group (USA). www.us.PenguinGroup.com. Carl Alasko reveals that the need to assign blame when something bad happens stems from a very deep desire we all share to "see justice done". Understandable when a grave crime has been committed, but it can become a dangerous habit if we begin to operate as though placing blame were somehow necessary if we want to change something or someone in our world. In Beyond Blame, the author teaches readers to recognize destruction that blame causes in their lives - oftentimes without their even being aware - and to put an end to it once and for all. Click here for more info or to order this book. Also available as a Kindle edition. Do Blame Attacks Include Criticism, Accusations and Humiliation?